If there is an unpredictable event that delays a trip, trip delay coverage compensates for some expenses. It may cover the cost of switching to a different airline, a hotel stay and other incurred expenses related to the delay. Airlines are not legally obligated to compensate travelers for delay-related expenses. Their only duty is to honor a ticket to a destination and reschedule the affected passengers on a future flight. Delays often cause travelers to pay for a hotel room, ground transportation and extra meal expenses. If the delay is extended, some people may need to buy additional necessities or prescription medications. The airline will not cover these items. Before calling the insurance company to request compensation, make every possible effort within individual financial means to modify the trip. For example, an airline may switch a flight that is cancelled because of a snowstorm in a layover city to another layover destination, which would make the trip possible to keep. When plans cannot be modified and money will be lost, contact the insurance company. Trip insurance with travel delay coverage is especially useful for people who are traveling to areas with a likelihood of civil unrest or inclement weather. It is always wise to purchase this coverage when planning a trip during the winter months. Also, travelers who have a strict budget and cannot afford to pay upfront for lodging, extra food or necessities should make room in the budget for this insurance. 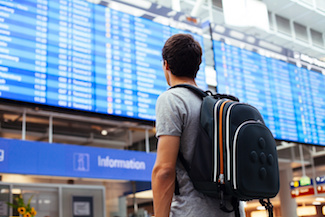 The cost of trip delay coverage is much less than the cost of re-booking a flight or paying for high-demand lodging and food for several days. Always compare plans from different companies and understand the specific terms and limitations before purchasing a policy.